Michael Bennett (top) and Nigel Bradham take down Saquon Barkley during the Eagles’ win on Sunday. Bradham broke his thumb during the game. 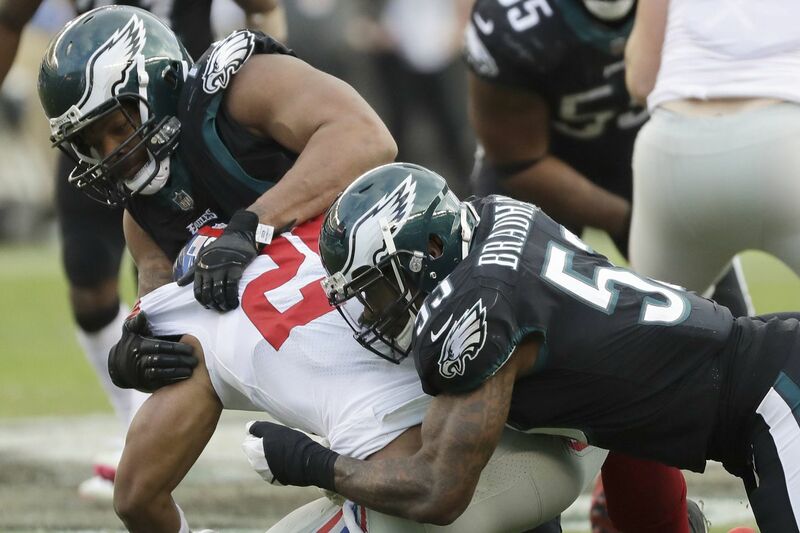 The Eagles defense has suffered yet another blow, this one in Sunday's come-from-behind win over the Giants. Linebacker Nigel Bradham broke his left thumb in three places in the 25-22 victory. He didn't miss a single snap, but he had surgery to repair the thumb on Monday. He said Wednesday that he fully intends to play in Monday night's critical division battle against the Redskins at the Linc. "I mean I assume so," he said. "I played Sunday [with it]. I'm pretty sure I'll be able to play with it [Monday]. I'll be able to protect it and keep it protected." Bradham said the injury was the result of "friendly fire" — a teammate ran in front of him and hit the thumb. Ken Flajole, the Eagles' linebackers coach, said the team's medical staff expects Bradham to be able to play. "It's probably comparable to what [linebacker] Kamu [Grugier-Hill] did to his thumb a few weeks back," Flajole said. "They'll find a way to protect it. Unless I get a different report, my expectation is he will play." Grugier-Hill broke his right thumb in the Eagles' Oct. 28 win over Jacksonville in London. He also needed surgery and didn't miss any time, although the Eagles then had their bye week, so he had an extra week to recover. The Eagles will face the Redskins in yet another must-win game with two of their three starting linebackers playing with casts on their hands, and Jordan Hicks expected to miss his second straight game with a calf injury. That Bradham continued to play with a broken thumb on Sunday is a tribute to 29-year-old's toughness. This is his fourth season with the Eagles, and he has yet to miss a game due to injury. He was one of several regulars who sat out last year's final regular-season game to rest for the playoffs. And he missed this season's opener against Atlanta while serving a league suspension for a 2016 incident in Florida. "He's a pretty tough nut," Flajole said. "He's been so durable for us. I look at all the injuries that have happened at other positions. Nigel's been the one constant guy that has not really had any down time for us, even though he's been hurt." Flajole recalled last year's win against the Carolina Panthers. Bradham suffered a shoulder stinger in the game and had to come out. "I wasn't sure how long we were going to lose him for," Flajole said. "But he goes into the medical tent and comes out a few minutes later and goes right back on the field and plays." Bradham, who signed a five-year, $40 million contract with the Eagles in March, said the fact that Hicks likely will miss his second straight game really has nothing to do with his decision to play Monday night. "I'm just me, man," he said. "I'm just that type of guy. I want to be out there regardless. That's always been my thing. Always trying to be available." Defensive coordinator Jim Schwartz made special mention Wednesday of Bradham and defensive end Michael Bennett, who both battled through injuries to help beat the Giants. "There probably are some players on other teams that would've said, 'You know what? I'm gonna sit this one out,' " Flajole said. "But those guys went back in and battled." Said Bradham: "It's something inside. Heart. That's the only answer for it, really. It was definitely painful. But it was something I had to get through. It was something I felt I could keep playing with. So I stayed out there." Bradham hasn't played nearly as well this season as he did a year ago, when he was instrumental in the Eagles' Super Bowl run. The impactful plays have been few and far between. [It's "not great, obviously," he said of his performance this season. "We're definitely not where we want to be as a team. Individually, I'm not where I want to be. I've missed a couple of plays. But I've made some too. "We're where we are [5-6] for a reason. Obviously we have to fight to get up out of this situation." When Hicks ruptured his Achilles tendon last season, Bradham took over the defensive play-calling duties. And he handled them in Hicks' absence Sunday, when the Giants scored on their first two possessions. "I started out a little rusty," he said. "When they came out, they came out fast. They were lining up fast. So, there's a lot of things I need to be better at. That's another thing I'll obviously be working on this week, too." Bradham will be at a disadvantage Monday night, essentially playing one-handed. That's not good news for a defense that has missed tackles at a record rate the last several games and needs to stop Redskins running back Adrian Peterson. But a one-handed Bradham is better than having a backup in there. "It can be difficult, particularly on tackles," Flajole said. "It's tough to grab cloth and wrap up" with a cast on one hand. "In the Dallas game, Kamu had a chance for an interception. I would think if he had two good hands, and not one with the other in a cast, that maybe he would've made that play. "So there are some challenges to it. But it's not insurmountable. People have played with it and played well. But there certainly are limitations as far as grabbing things."